For my deployement of Kolide Fleet I used Ubuntu 16.04 server (64bit). Once you've installed Ubuntu you should update and upgrade the packages on they system. Now make sure you have curl installed as it is required for the getting Golang installed. According to the Kolide Launcher and Fleet documentation you will need to have Go 1.9 or greater installed. I followed Patrick Dahlke's "How to Install Go" post on Medium. The version of Go I installed for this project was 1.9.4. Setting your $GOPATH is critical for getting things to work! In addition go Go, you will need to install the build-essentials packages specifically for make, you will also need to install libc6-dev, gcc, g++ and dpkg-dev. Additional required software includes npm and yarn. NPM can be installed via the standard Ubuntu repositories. For yarn you will need to add their repository. Node.js is also required. For me the version that was installed by default was v4.2.6 which is incompatible with fleet. Install Docker CE and Docker Compose. I used the the installation guide found on docker docks. Setup apt to use the docker repository over https. Now its time to add the "stable" docker repository. If you prefer you can add, edge or test. I found it necessary to add user: "1000:50" to the docker-compose.yml file to get things working properly, without it mysql will not startup, it throws an error, "mysqld: Can't create/write to file '/tmp/' (Errcode: 13 - Permission denied)"
Now its time to startup the infrastructure requirements for Fleet that includes redis, mysql server, and mailhog. You can use the -d flag for docker-compose up if you prefer and use docker-compose logs to check for startup errors if you prefer. The next step is to setup the database schema, if you are did not use the -d flag in your docker-compose command you will need to run the follwing in another terminal shell. Once the server is running open your browser and go to https://localhost:8080 and follow the setup process. Securing your kolide server is critical, so don't forget to enable the firewall and restrict access. For my environment I enabled 443 access in order for endpoints to connect, and ssh for management of the server. A good first step is to determine if you want to support IPv6 or not. It should return the value of 1. From all of the documentation I've read the only way to currently get packages built for MacOS is to install launcher on a MacOS system. You will need to install Go (1.9 or greater). Again setting your $GOPATH is critical for getting things to work! Just like we did with Fleet we need to install the dependencies and build the binaries. Package Builder will need the Enroll Secret code in order to build the packages specific to your kolide server. You can find the Enrol Secret by logging into kolide and clicking on the Add New Host button. I prefer to utilize the package-builder for deploying osquery to MacOS and Linux systems. First, make sure you have zip installed. To create the packages for MacOS and Linux you can run the following. Note if you have a valid certificate you can drop the --insecure flag. Adding the --autoupdate allows for push updates, wiithout it you will need ot create new packages for updates and push them out. I used the installation instructions found on the Osquery website. My Windows skills are lacking so that probably contributed with my struggles in setting osquery up. I performed so much troubleshooting that I didn't do a good job capturing everything I did, however, what I've provided I was able to replicate several times. I found the best way to install osquery on windows is using Chocolatey. Installation instructions for Chocolatey can be found here. Once installed you can run the following command. If you want osquery to run as a service make sure you use the params flag below. The official documenation can be found here. Once installed we need to make some configuration changes in order to connect to our Kolide server. First add your configuration information to the osquery.flags file. I would have preferred to use a kolide.flags file, however, the service is already pointed to the osquery.flags file and I'm not sure how to change it and didn't really want to spend the time researching how to do it. With Linux and macOS the osquery.flags file begins with osqueryd followed by the list of flags. The Windows osquery service will not start with osqueryd in the flag file. I also removed the space before each flag. 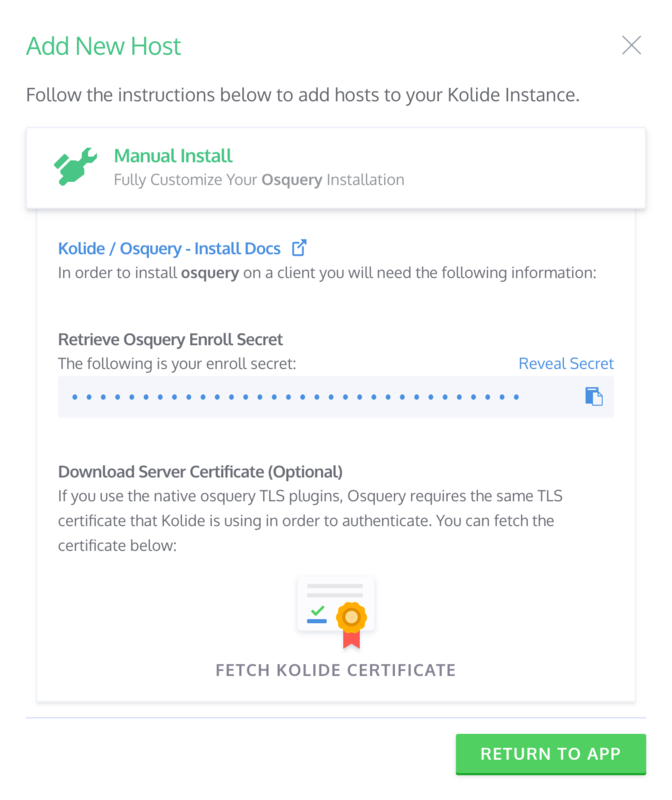 I also found if you are using a signed certificate for your Kolide server you do not need to have a flag pointing to the certificate. Having --tls_server_certs=c:\ProgramData\osquery\certs\kolide.server.crt in the flags file caused TLS connection errors. Once I removed it I was able to successfully connect the system to the Kolide server. With those changes we can now test running osquweryd. I found it very useful to start the daemon via the command prompt because it outputs any errors there. Open the command prompt as Administrator and change directories to c:\ProgramData\osquery\osqueryd and run the following command. If everything is configured properly you should see plenty of output showing the system connecting to the Kolide server. You can double check in the Kolide interface under Hosts -> New. Now you can kill the daemon and start osqueryd via the Services.App. In preparation for building the msi installer I did some "cleanup" where I deleted the certs.pem file located in the certs directory. Doing so completely killed my connection to the Kolide server. I have not investigated into why that happened, however, because I didn't have a backup of the file I and to reinstall osquery via choco. The first time I ran the command it failed with an error, "clang is not a full path and was not found in the path." To fix the problem I followed the steps outlined in this MSDN blog post. When I executed the PowerShell command I received an error, "cannot be loaded because running scripts is disabled on this system." I made the following changes in order for the script to run. At the time of documenting my install procedure I ran into a problem where a endpoint would partially connect to Kolide but never fully populate the data. On the client side I was receiving an error, "json: cannot unmarshal number into Go struct field distributedQueryResultsShim.statuses of type string." I then went through the 3 steps listed above, make-win64-dev-env.bat and make-win64-binaries.bat followed by the make_windows_package.ps1. Now for the fun part, installing msi's, rpm's, dep's, and pkgs on your endpoints, as well as, begining to play with osquery packages etc! Meet the SGT, an osquery Management Server Built Entirely on AWS! Part One - Trail of Bits Blog - How are teams currently using osquery? Part Two - What are the current pain points of osquery?